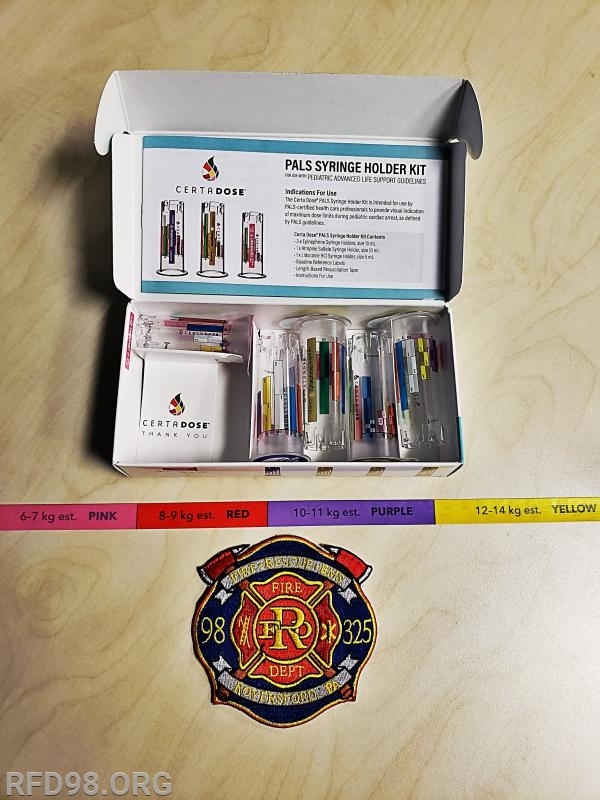 Royersford Fire Department & Friendship Ambulance are proud to be the first EMS organization in the region to purchase and implement the Certa Dose PALS Syringe Holder Kit on all our ambulances. Pediatric Advanced Life Support, or PALS, is the standard of care when EMS and hospital providers encounter critically sick pediatric patients and one of the most stressful situations a provider can imagine is a critical pediatric emergency. Study after study have shown in high stress situations inadvertent errors are more likely to be made. One of the biggest differences between caring for an adult patient and pediatric one is medications are weight-based. As one can imagine trying to do accurate weight based calculations quickly in a high-stress situation sets up a less an ideal scenario. The PALS Syringe Holder Kit is a color coded system based on a universal measuring tool designed to make pediatric emergencies easier to treat. A hard plastic sleeve for a particular medication is placed over the barrel of the syringe and providers can then administer the appropriate medication dose using color coded bars. Each ambulance in the RFD fleet has this kit in addition to a special bag containing pediatric equipment. Royersford Fire Department & Friendship Ambulance continues to bring cutting edge, innovative technologies and equipment to the Spring-Ford community. The Certa Dose PALS Syringe Holder Kit is an invaluable tool to ensure our pediatric patients receive the best pre-hospital care available.